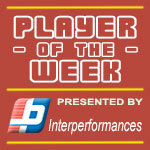 American Forward Savon Goodman (198-F) put on an extraordinary performance in the last round for second-ranked Stapac, receiving a Interperformances Player of the Week award for round 3. The player had a double-double of 25 points and 17 rebounds, while his team crushed Satya Wacana (#3, 1-2) with 20-point margin 83-63. Stapac maintains the 2nd position in their group in Indonesian IBL. Stapac is a typical solid league team placed somewhere in the middle or a little bit lower in the standings. They need more victories to improve their 1-1 record. Goodman turned to be Stapac's top player in his first season with the team. Savon Goodman averages just after two games 19.5ppg and 15.5rpg. 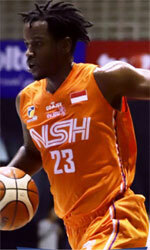 The second best player in last round's games was 24-year old American Michael Vigilance (203-F-94) of Siliwangi. Vigilance had a very good evening with a double-double of 23 points and 26 rebounds. Bad luck as Siliwangi was edged by Hang Tuah (2-1) 77-74. The season is still at the very beginning and this lost game may not be such crucial, of course if they start win the games. Let's wait for the next round. Vigilance is a newcomer at Siliwangi, but is already one of team's top players. Former Clark Atlanta University star Vigilance is a former Eurobasket Summer League player, which is considered top international summer league in the market. Third on the list of top players last round was American guard Gary Jacobs (188-G-92) of league's second-best Hang Tuah. Jacobs got into 30-points club by scoring exactly 30 points in the last round. He went also for six rebounds . He was a key player of Hang Tuah, leading his team to a 77-74 win against #4 ranked Siliwangi in a game of the week. Hang Tuah needs these victories very badly if they think about taking over top position in White Group. Their record at this point is 2 victories and 1 lost games. Jacobs has a very solid season. In 3 games in Indonesia he scored 20.3ppg. Jacobs attended one of camps at Eurobasket Summer League on his way to pro basketball.